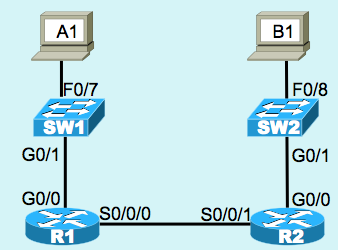 Today’s post poses a #CCNA question about a serial link, in the guise of an interview question. Imagine you walk into the interview, and the interviewer draws a small network diagram, and asks you to diagnose a problem? That’s the basic setup. 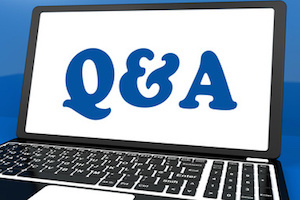 This question focuses on troubleshooting point-to-point serial links. As usual, the question is below the fold, with the answer posted in a few days! Ask questions if you have them, but don’t spoil the answer yet for others. One page of documentation shows the output of the show interfaces s0/0/0 command on router R1. However, the documentation shows nothing about router R2. Additionally, above the figure on the board, the words “This figure is correct (Scott)!” are written. So, if you take the figure and command output as both being correct, which of the following answers lists items that might be a cause of the interface not being in an “up and up” state? Two options can be eliminated right away since the interface is “up”. But the line being “down” … well that’s another problem. Hi Mike – thanks for the note here, and at LinkedIn! Indeed, once you try this stuff on GNS3 or a simulator, the interface state stuff can skew a little away from what real gear does. Thanks for playing!